No one dreams of having travellers’ diarrhea during a trip in a foreign country. Here is how to avoid the unpleasantness of this rather common problem. Travellers' diarrhea or the infamous "turista"
It’s wonderful to be able to bring home precious memories from a trip. However, we could do without the memories of travellers’ diarrhea! This illness, commonly called “turista”, can be particularly unpleasant, but is rarely very serious. It is probably one of the most common illnesses affecting travellers. 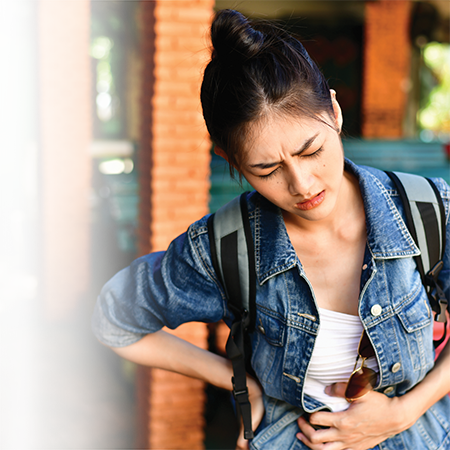 Although it is most often caused by bacteria, travellers’ diarrhea can be due to an infection caused by a virus or a parasite. Symptoms can appear at any time during the trip and up to 7 to 10 days after returning. Without treatment, they usually last between 1 to 5 days, but sometimes more than a week. How can travellers’ diarrhea be prevented? Never drink tap water; drink only bottled or purified water. Brush your teeth with bottled or purified water as well. Make sure ice cubes put in your drinks are not made from tap water. Do not consume anything that has not been boiled, cooked or peeled. Peel the fruits that you eat yourself. Do not consume non-pasteurized milk products. Avoid fresh foods that have been left out at room temperature for a long time: guacamole, fruit salad or chicken, buffet food or food stands, etc. Refrain from eating undercooked foods (e.g., meat, seafood, eggs, etc.). Try to stick to the following rule: it is preferable to eat hot foods hot, and cold foods cold. Wash your hands thoroughly before eating or drinking and after having gone to the washroom. Never touch a wild or stray animal. Avoid close contact (such as kissing) with an infected person. How can travellers’ diarrhea be treated? If you plan to travel to an at-risk area, you can obtain a prescription treatment to take if you begin symptoms of travellers’ diarrhea. This type of treatment is effective only if diarrhea is caused by bacteria. It is important to closely follow the prescriber’s recommendations. Note that a consultation can be made with a pharmacist to obtain a prescription and the appropriate advice. One important aspect of treatment is the prevention of dehydration. The loss of fluids and electrolytes caused by travellers’ diarrhea can have serious repercussions on health. Therefore, it is important to drink plenty of water to prevent the problem. Rehydration solutions, like the ones provided at the pharmacy, can be considered. Powder formulations (to be mixed with water) have the benefit of being easier to carry in luggage. Some medications can alleviate symptoms like diarrhea (loperamide and bismuth salicylate) or nausea (dimenhydriante). Most of these medications are available over-the-counter, but you should always ask your pharmacist for advice before purchasing them. When travellers’ diarrhea occurs, some people turn to probiotics. Indeed, some data suggests that they help maintain intestinal health, and to prevent or relieve diarrhea in this context. Discuss this issue with your pharmacist to obtain additional information. Speak to your pharmacist for additional information about travellers’ diarrhea and its treatments.